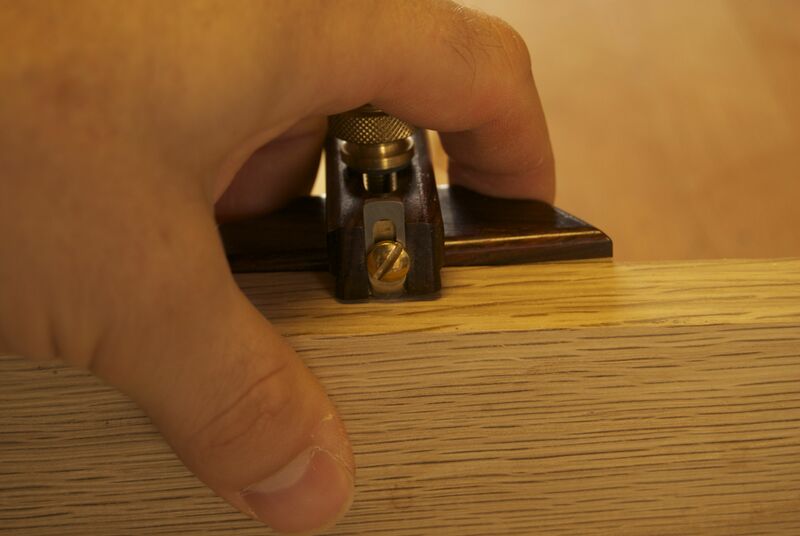 Everything we do in woodworking relies on accurate marking out. Without accurate and clear layout, it really does not matter how good your sawing or planing skills are, so it makes sense to invest in good quality layout tools. I’ve been happily using the ubiquitous Titemark marking gauge for over two years now, but sometimes having multiple gauges comes in useful, and recently I hard a layout task for which the Titemark was not suitable. This gave me the excuse to finally order a 4″ marking gauge from Jeff Hamilton (by way of the tool store run by New English Workshop). I’ve been lusting after Jeff’s frankly gorgeous gauges since Chris Schwarz wrote a review of his panel gauge, so it was only a matter of time until I added a Hamilton marking gauge to my tool chest. Jeff offers two sizes of marking gage (4″ and 6″) plus the panel gauge, in a range of timbers. I’ve always been fond of cocobolo since I built my 12 string acoustic guitar (which included a cocobolo bridge and headstock veneer) so I plumbed for that timber, although the cherry, walnut, African blackwood, and curly maple all look stunning as well. If I thought that the pictures of the marking gauges were beautiful, I really wasn’t prepared for how these look in the flesh. The 4″ gauge is simply gorgeous; dainty and delicate but still exuding the air of a serious tool. Built from quarter sawn stock and finished to a very high standard, the gauge has a wonderfully tactile finish, in part due to the lovely bat wing curves of the fence. The fence itself is brass, and secured by a robust feeling knurled knob, while a thumbnail shaped blade takes care of marking duties. Shipping each tool in a drawstring bag is another nice touch. Those batwing curves on the fence have a number of purposes beyond adding to the sublime look of the gauge. Firstly they increase the amount of exposed end grain, so keeping the fence stable throughout seasonal humidity changes. Secondly, they provide a comfortable and excellent way to pull the fence up against the workpiece when scribing a line (as shown below). Good looks are all very nice, but if a tool doesn’t work well then it does not retain its spot in my tool chest for long. 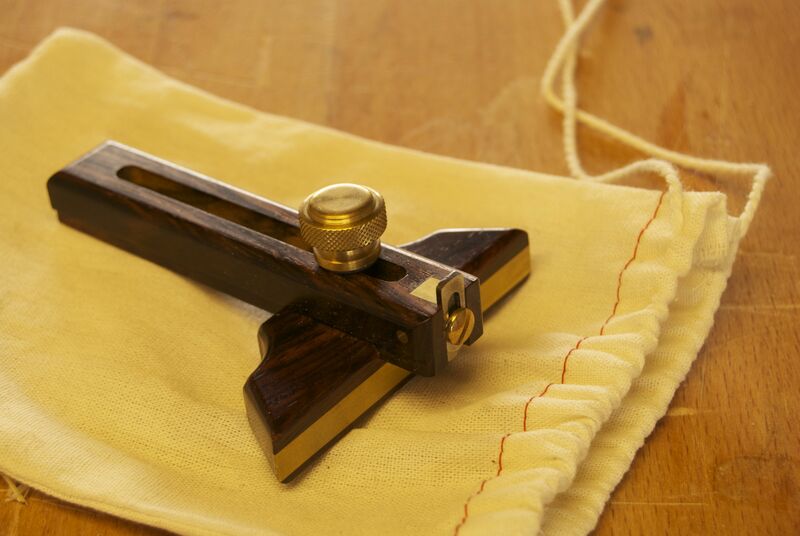 There are no such issues with the Hamilton marking gauge however, as in use the gauge works perfectly. The wide fence provides an excellent and stable datum against the workpiece, and the marking blade has scored everything from southern yellow pine to oak in my shop without any difficulties. The low profile of the fence compared to the large wheel of the Titemark is also a noticeable advantage. When laying out the hinges on my Anarchist’s Tool Chest, I found that the upper skirt on the chest was fouling the fence of the Titemark and prevented me from marking out an accurate line. The lower profile of the Hamilton gauge allowed me to get in close to the workpiece and scribe an accurate line without any fuss. The brass knob also locks securely and I’ve not experienced any slippage when marking out long runs. In short, this gauge is a keeper, and I can see it getting a lot of use in my shop, from the usual joinery layout to marking the thickness of guitar headstocks. I will definitely be adding one of Jeff’s panel gauges to my tool chest in the very near future, which I suppose is the best I can say about any tool.